I guess I ought to stop apologising for being late with these posts, and just accept the fact that I just don’t get around to things quickly enough these days. I’m pretty much retired now (although just starting some new complex systems research) so you’d think I’d have time. Seems to escape me though. And, no, I’m not spending all my time watching daytime TV. In any case, I left you back at Brands Hatch after a rather traumatic first race of the season which ended up with me dumping coolant all over the place and running for some time with an engine that was pretty much uncooled. So at that point I’d started two races finishing with a DNF in one and so far back in the other that it didn’t count. Not an auspicious start to the season. And, unfortunately, so it carried on. I eventually traced the problem that I’d had with the cooling system to a randomly dodgy earth connection for the relay that drives the water pump. That is, the pump had stopped leading to boiling over in about 100 milliseconds… Took me ages to find that too, even after starting the next meeting at Croft. What I also did was change the engine back to the one I’d used last year, even though that one had done the Birkett as well as the season’s racing. I took the over heated engine off to Mike Smith for his expert fettling. The racing, though, was great fun with a super battle with Olly in one of the races. This is the interview that Charlie did in the paddock after the race with me and Colin; you can see how much fun we had. I was 6th in each of the Croft races, so my results were now 16/DNF/6/6 which at least was slight better. 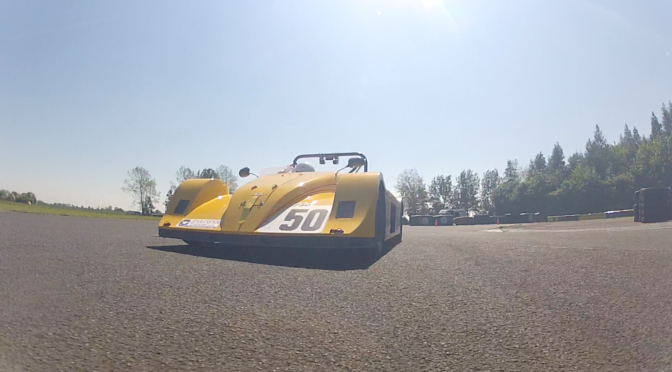 After Croft we headed off for Pembrey. This is a great circuit although a bit hard to get to. The problem has always been that the circuit manager is pretty unhelpful and although it had been advertised that all was going to be OK it all went downhill. It has to be said that I’ve never come across such unhelpful people on a race circuit before. I shall be thinking long and hard before making a trek all the way down here again. And so it was off to Cadwell. To be honest although this is a great circuit it’s not really ideal for our cars as it pretty much comes down to overtaking by consent. What’s more, there was a huge storm on the Saturday evening and the race on Sunday was pretty wet. However, I ended up with a 7th and a 4th. At least I finished both races. So that was the first race which was really fun. I ended up 4th but that pretty much irrelevant. However, when the second race came around even though I got a decent start I was pretty soon plagued by a misfire. I struggled on for a while but it was pretty clear that I wasn’t going to make the end of the race so I retired. That left me with a 4th and a DNF. After Silverstone I changed pretty much everything to try and cure the misfire. As it happens I set off for Anglesey and as soon as I was out on track the bloody thing appeared again. However, I then changed the cam sensor, again, and this time it went away. The cam sensors are pretty much one of the Achilles heels of these engines. They seem to die at the drop of a hat. So, chuffed with the thing actually working again. I qualified 7th but half way into the race there was a bang from the rear of the car and I pulled off. Back in the paddock it was clear that one of the rear CVs had scattered balls and grease all over the place. Lacking a spare that meant the race weekend was over. Back home I phoned Andy to ask what the CV joint was and was amazed to find out that he didn’t know. So, I had to find out for myself which took some time. At the end I changed both of the joints and have got a spare which will contribute to the massive amount of junk that I take to race meetings. The final meeting of the year was at Snetterton, a circuit that I’m very familiar with. The first race went fairly well, I finished in 5th place. However, in the queue for post race scrutineering it was clear that the engine was making a horrible noise. It was clear later that it was making the well known CBR1000RR death rattle noise which is caused by the crank falling apart. The end results of the season were therefore that I’d been entered for 14 races and only got a result in 8 of them. What’s more one of these was a fake because the engine had dumped all its coolant out. The winter is therefore going to be a time for rebuilding lots of things and aiming for reliability.